Atta Kim — Approaching a Universal? This afternoon we saw, Atta Kim: On Air, an exhibition of large format photographs by the Korean artist Atta Kim at the International Center of Photography. Most of the work in this small show is visually interesting and conceptually clever. 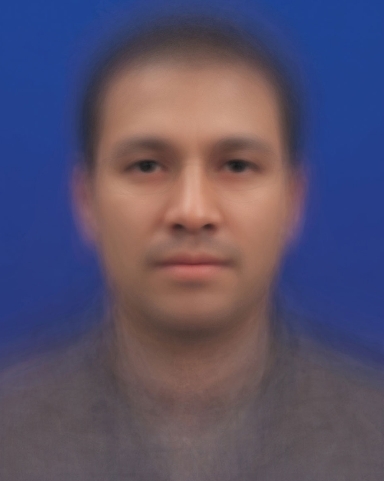 The most remarkable and noteworthy images, however, are the composite photos of faces: Self-Portrait Series, 100 Tibetan Men, 2005; Self-Portrait Series, 100 Tibetan Women, 2005; and Self-Portrait Series, 100 Countries/100 Men, 2004. For each of the images, Kim photographed 100 visually distinct individuals and layered the images to form a composite “portrait”. The results are not necessarily what you’d expect. The final image is, I assume, the mean of the individual images. The differences at the edges in the size and shape of the ears, the size of the head, the configuration of the hair, etc. are rendered out-of-focus. The regions in sharpest focus are around the eyes, nose, cheeks, and mouth. I was struck by the fact that elements one would typically refer to as flaws — a crooked nose, scars, skin blemishes, asymmetries, etc. — are cancelled out in the composite. The result a kind of perfect and symmetric beauty — a straight and gently rounded nose, wide round eyes, full lips, and a smooth round face overall. The individual images from which the composites were formed are exhibited with the final work. It’s worth considering the source for each. You may be inclined to think that 100 images of Tibetan men and women would, given the biological and regional parameters, reveal general similarities. And, to some extent, they do. But the 100 men from 100 different countries are about as diverse a set as you would find if each individual was chosen randomly. (One qualification: Judging from the source photos, I would guess the age of the subjects ranged from around 24 to 60.) Head size and shape, skin color, amount and configuration of hair, shape of noses, chins, eyes, etc. vary considerably from one person to the next. If Kim has not intervened to smooth out or in any way alter the composite, the result is not what I would have predicted. This is not a monster. Far from it. The composite figure strikes me as serene, appealing, and beautiful. (This is true of all three figures, by the way.) Why is that the case? Holland Cotter’s review of the exhibition is in the 12 July 2006 New York Times. This entry was posted in Art, Philosophy, Science by tq. Bookmark the permalink. Amazing. Will most likely will use this for my final project.